UPDATE: Make sure to check Shopkick and Foursquare for this coupon too! And you can also text 5ONUS to 78697 to get an additional coupon. 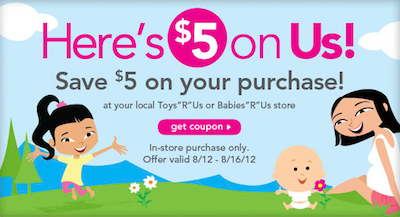 Here’s a rare printable coupon for Toys R Us or Babies R Us! Head over to the Toys R Us website, click on the “Save $5 on Your Purchase!” link on the side of the page, and you can print a coupon for $5 off any purchase at Toys R Us or Babies R Us. My coupon printed with an expiration date of 8/16, and there is no minimum purchase requirement! 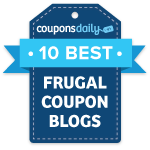 That means you should be able to score some items for free or very cheap after this coupon.